One of the cable TV channels in the U.S. during November to hold a survey of about 2,800 respondents. Overall the survey participants were asked about the e-reader device they want to buy. And, it turns out the results as much as 48% of respondents are more likely to buy the Apple iPad. Then the other 33% refers to the Amazon Kindle. Then gadgets Nook (Barnes & Noble) just posted a 4% votes. And that's bigger than the touch-based e-reader, Sony Reader (Sony), which is limited to 1%. For information, Amazon Kindle is a dedicated device for reading the electronic version of a digital newspaper. Thus, the display content that was like a regular newspaper converted into digital models. 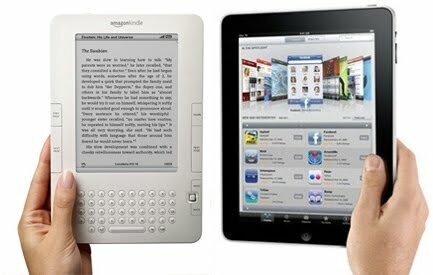 In any Apple iPad technology proved better than the Amazon Kindle, which is capable of displaying a variety of color content. In fact, the applications available for Apple's tablet even this claim are more numerous. As a result, not surprisingly, proved to many that tend to be yearning iPad than Kindle.